In our printed catalogues and in our website listings, we commonly refer to the Scott Catalogue price. If a catalogue price is not available then we will give an estimated value. Below is an example of how the listings appear. Lot 2088 lists Scott Catalogue value. Lot 2089 lists our estimated value. 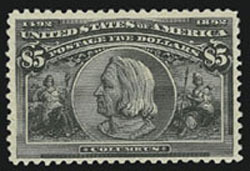 Stamps can be found in a wide range of conditions, which can significantly affect value. The following factors affect condition: Gum, centering, impression, size of margins, color, perforations, overall appearance, clearness, color and type of cancel (for used stamps) and the presence or lack of faults. 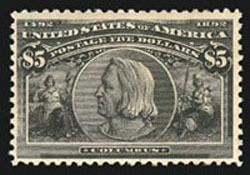 Some stamps are simply not found in perfectly centered and superb condition. In some instances, we have published census information illustrating every recorded example of the rarest of these stamps. This allows collectors to examine the entire supply to determine which are the best examples in existence, and to track their sales history. These can be seen at our website in the Siegel Encyclopedia, in the Census section. In most instances grades are based exclusively on centering. However, for stamps where the example offered is the finest or among the finest for the issue, or for other rarities such as certain 19th Century stamps in Mint Never-hinged condition, we apply a relative grading scale to more adequately reflect the rarity of those particular stamps. For an explanation of symbols, grading terms and for our chart on gum terms, please refer to the Grading Terms and Abbreviations page of our website. Bidders are also encouraged to search through the online archives of our past auctions, to look for comparable examples and their selling price as a guide to bidding. Catalogues are available from 1997 onwards in the Prices Realized section of our website. 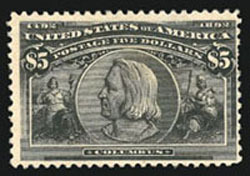 Below are several examples of the $5.00 Columbian. As the prices realized indicates, condition is a significant factor in value. 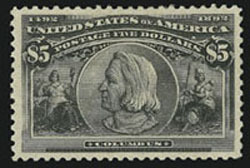 In some cases stamps will bring less than Scott Catalogue value. In other instances, stamps will bring many multiples of catalogue value. EXTREMELY FINE GEM. AS PERFECT AND FRESH AS THE DAY IT WAS PURCHASED AT THE POST OFFICE IN 1893. ARGUABLY THE FINEST MINT NEVER HINGED EXAMPLE OF THE $5.00 COLUMBIAN IN EXISTENCE. EXTREMELY FINE. A RARE MINT NEVER-HINGED $5.00 COLUMBIAN WITH SUPERB CENTERING AND REMARKABLY FRESHNESS. In our 2000 Rarities sale, we offered a $5.00 Columbian in Extremely Fine Mint N.H. condition, which came from the Maine Safe Deposit Box find. It realized $45,000. 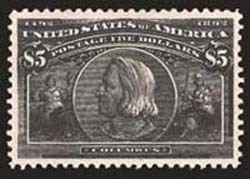 To prepare our description of that stamp, we surveyed dozens of auction catalogues, searching for Mint Never-Hinged examples in Extremely Fine grade. We found no more than ten stamps, some from auctions dating back 40 years, and there is no guarantee that all of the stamps previously described as Mint N.H. would pass the test today. 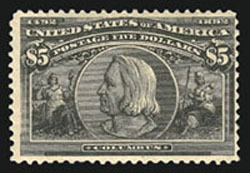 The rarity of the $5.00 Columbian in Mint N.H. condition is easily explained. For more than a century, collectors have proudly hinged this highest value of the Columbian set in their albums, and the vast majority of stamps have not escaped the hinge. 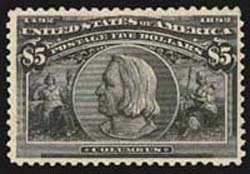 Only the break-up of blocks, which rarely contain Mint N.H. stamps, has provided the few Extremely Fine Mint N.H. $5.00 Columbian stamps extant today. EXTREMELY FINE GEM. A SUPERB EXAMPLE OF THE $5.00 COLUMBIAN.